Do you regularly go to meetings with your software development team? Do you feel like they could be better? Learn some tips on how to make them better in this article. Probably the easiest way to make a development team meetings better is to set an agenda. I’ve mentioned this inother articles on meetingsas I think it’s important. An agenda is a pre-determined list of points that will be discussed at the meeting. It’s usually set by the team leader or the person who organises the meeting. Depending on the type of meeting and the projects you’re working on, the agenda will be different, but having one is still a good idea. What did you work onyesterday? What are you working ontoday? A similar agenda could be put in place for weekly development team meetings. There could even be a “news” item, to discuss anything that the team would need to know. Having an agenda keeps the meeting on course, and doesn’t waste people’s time with things that don’t need to be discussed. If you’ve found that you’ve discussed everything on the agenda and the allocated time isn’t over, then you can finish early. People can get time in their day back! Another way to improve your development team meetings is not having them too often. Having a meeting too often means that it isn’t as relevant, and more time gets wasted in meetings than what should be spent doing actual code. Daily, for 15 minutes– If you’re in an Agile team, then having a daily standup meeting is common. However, goes for 15 minutes at the most. 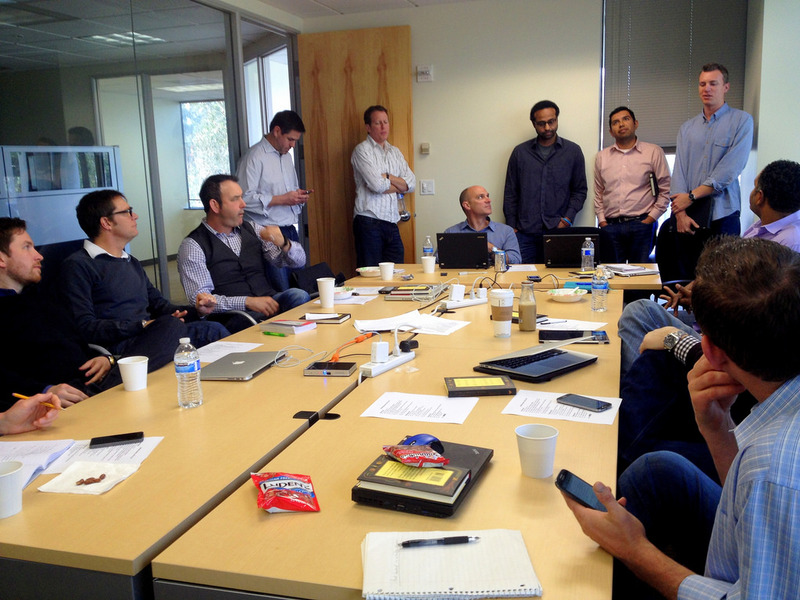 Weekly, for 30 minutes– Many development teams have a weekly team meeting. This should not go for longer than 30 minutes and should not be more frequent than once per week. There is no need to have meetings any more frequent than that. If you follow the stand-up method then daily is OK, otherwise have a meeting weekly. Think of how much time is being wasted by having more regular meetings. An extra 30-60 minutes per week, for each person in the meeting, is a lot of time that could be spent doing something productive. Depending on the company you work for, the work environment and the times of work may be different. I’ve been in teams where the developers and other team members arrive about 9:30 or even 10 in the morning, and other teams I’ve seenarrive about 8:30 in the morning. Having a 9AM meeting for a team that arrives closer to 10AM is not something that will work very well. So, you’ll need to consider the hours that the team works when deciding what time of day the meeting should be. Also, another thing to consider isother events that may happen. Suppose there is a broader team meeting that happens every week, and your meeting may need to come after it. Or, there is a code refresh or system change that goes in every day or every week at a certain time. Your team might need to be at their desks at this time in case something goes wrong or if they have some work to do on it. This should also be considered when deciding what time to have your development team meeting. Also, try to avoid the hours from 12 to 2. This is the standard lunch break period. People won’t have a full 2 hour lunch, but most of the time, lunch is taken in that two hour period for an hour or so. As well as setting the length and time of day for your development team meetings, the duration also needs to be considered. Nobody wants to sit in meetings that go on for too long. I mentioned earlier that there should only be two lengths of meetings – a 15 minute daily standup or a 30 minute team meeting. Any longer than this is too long. What could possibly be discussed that can’t be done in 30 minutes each week? I’ve been in teams and seen other teams have meetings that go for an hour, or an hour and a half. An hour and a half! That’s way too long for a team meeting. Getting everyone in a room each week for an hour and a half is a big waste of time. Even an hour is pushing it… but I have seen this done quite often. The less time you spend in meetings, the more work gets done.It’s not just “and extra half hour”, it’s an extra half hour for everyone in the room. If the meeting has 10 people in it, that’s 5 hours of work that is lost. That’s almost a full day. If you find you can’t get through the meeting in 30 minutes, either make the agenda smaller or make each discussion point smaller. Alright, enough about the times of a meeting. Another great way to improve your development team meetings is to get people to contribute. The team meeting involves the team for a reason. Meetings are much better when the team members have things they can say, rather than the team leader just sitting there and speaking for the whole time. My favourite thing to mention when I’m in a development team is a win for the week. This is a good way to open the meeting and can get people excited and in a good mood. It’s a way to mention a problem you’ve solved or something good you’ve done on your project. Getting people to contribute will make the meeting more valuable for everyone. Arguably the most important part of the meeting is theactions. The actions are the things in the meeting that people are asked to do outside the meeting. These can be requested from the team leader, or from other team members. They can be anything from sending an email, talking to someone, getting some data, fixing a problem, and so on. The actions should be written down by whoever is running the meeting. For example, if someone in the team named Russell needs to speak to John from the testing team about a particular issue, then the action would be “Russell to speak to John about form defect by Thursday”. When you write actions, they should also have adeadline. This way, there is a certain timeframe that they need to get completed in. If they don’t have a deadline, the actions may not get done. Make the actions clear and make sure the people who have the action assigned to them know about them. There is a common joke in the industry about assigning all actions to the one person who didn’t show up to the meeting, but that’s just the team messing around! Also, once the action is set, it’s important to follow up on it. Make sure the person who has been assigned the action (the person who is going do to it) is checked up on and provides an update. This can either be between development team meetings, or at the next meeting. If you don’t follow up, it can get forgotten. Well, there’s my list of things that we can do to improve development team meetings. What has your experience been like? How have you improved your team meetings? Share your points in the section below!